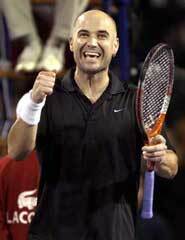 Andre Agassi a Las Vegan will end a tennis pro career, which has generated 60 singles titles and spanned 20 years as he looks to make one final tennis championship run at the U.S. Open in New York. The 36-year-old Las Vegan, who is unseeded at the US Open for the first time since 1997 and is still being plagued by a bad back, faces Andrei Pavel of Romania at what will be a sold-out and emotionally charged Arthur Ashe Stadium. Theirs is the only scheduled match for the evening session and will be preceded by a special ceremony to pay homage to another American tennis legend — Billie Jean King — as the USTA National Tennis Center is named in her honor. “I’m looking forward to the week,” Agassi said Saturday after participating in Arthur Ashe Kids Day. “For me physically, it’s unfortunately part of my decision for, part of my reasons for the decision for this to be my last tournament. It is a bit unpredictable for me. Sunday was a quiet day. Agassi, prince of tennis, was scheduled to practice at Arthur Ashe Stadium but heavy rains washed out his workout at Flushing Meadows and kept him indoors in Manhattan. So ready or not, his final hurrah begins at approximately 5:45 p.m. (PST). La Scala Lake Las Vegas homes for sale is an enclave of private Lake Las Vegas luxury homes within a 320-acre private lake within Lake Las Vegas Resort. Lakefront La Scala homes inspired by the natural charm and warmth of Tuscany. Southern Nevada desert landscape is the backdrop of this beautiful location. Experience the pleasures of living at the water’s edge in a desert oasis. Stroll along the lake to the impossibly beautiful world-class Jack Nicklaus Signature and Tom Weiskopf Designed Lake Las Vegas golf courses. MonteLago Village Lake Las Vegas has some delightful restaurants nearby. Enjoy the Montelago Casino, Lake Las Vegas marina and a host of other amenities. La Scala Las Vegas real estate has it all. Lake Las Vegas Las Scala homes prices range from the upper 300 to the upper $400,000s. Each Storied Place consists of a intimate collection of exquisite vacation homes. Inspired authentic architectural style, craftsmanship and exceptional attention to detail and design make each community distinct. WesTech Business Center Las Vegas commercial real estate, a 143,000-square-foot midbay distribution center, was built in 2002 at Edmond Street and Diablo Drive. Its second phase was sold to Cable Capital Trust for $129 a square foot. Las Vegas commercial real estate developer Jeff LaPour has sold the second phase of Las Vegas WesTech Business Center in southwest Las Vegas to Cable Capital Trust for $18.5 million. The 143,000-square-foot midbay distribution center was built in 2002 on nine acres at Diablo Drive and Edmond Street and Diablo Drive. LaPour paid $5.75 a square foot for the Las Vegas land with total construction cost of about $9 million.